Google's $300 unlocked Nexus 4 handset goes on sale tomorrow, and with it customers will have a very dull choice of protective case accessories. The official Nexus 4 Bumper is Google's shameless Apple iPhone 4 Bumper copy, only less appealing and pretty much available in no color choice at all even though Google claims you can customize the look of your Nexus 4 using the Bumper case. 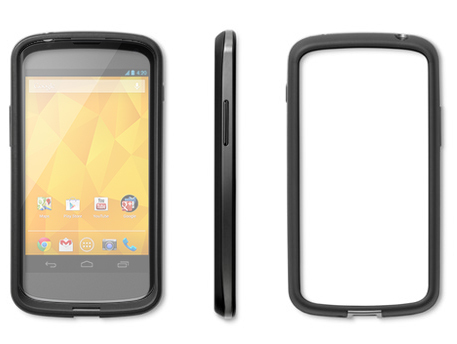 Typical of Google, the're no saying what the Nexus 4 Bumper case is actually made from or what it actually features. But as far as we can tell, it looks to have integrated volume and power buttons with the obvious port cutouts. And at just $20, it's safe to say the Nexus 4 Bumper is made from a standard TPU plastic material that should give you a decent amount of protection to help avoid cracking the front and back glass panels in case you drop it. If the Nexus 4 Bumper looks too boring to you, don't fret because companies like Spigen are already working on brining their great case offerings designed to encase the Nexus 4.